I received many sports-related items for Christmas this year! My mother went Tribe-crazy on me for Christmas this year, and I am glad she did! :-) My Aunt went very 'Burgh on me (she sent a "75 Years of Steelers" SI mag and a cool a Steelers T-shirt). My mother-in-law got me a box of 2007 Topps Updates and Highlights. I got a fitted Tribe hat! I'm looking forward to installing my new hitch "cover!" I have never seen these before! They are headrests for the front seats in my truck! The shirt not only sports a vintage "Wahoo," but it has my NAME on the back! In fact, my kids each got one, too! I have seen these in magazines, so I was VERY excited to open this puppy up!! How about some cool Tribe sweats? Mom got me these, and Shan had gotten me some camo flannel pants, so I will be warm for sure! I also got a cool light jacket with the Indians logo on it! And, to my surprise, I got ANOTHER Tribe framed picture with my name on it! I hope you all had a very Merry Christmas and Happy Holiday! Rocco requested Braves, Falcons, and FSU Football players. I didn't think I could pull it off, but I will let you be the judge: Twelve Chris Chandlers, eleven Jamal Anderson, ten Warrick Dunn, nine Leaf/Donruss Falcons, eight Braves pitchers, seven Seminole players, six Greg Vaughn cards, FIVE JEFF BLAUSERS... Four Devon Brazeltons, three Ben Grieves, two Jason Tyners, and a '77 Topps baseball card! Joey, your twelfth day goes something like this: Twelve Nolan Ryans, eleven random Rangers, ten Don Mattinglys, nine Rusty Greer's, eight Richard Hildagos, seven Billy Wagners, six Jeff Bagwells, FIVE '76 RANGERS.... four Pudge cards, three Paul O'Neills, two Blaylock Goudeys, and a Doug Rader '71 Topps! Bo, who asked for Yankees this year, gets a slightly different kind of surprise because I forgot to write down what was on the fourth day! So, here's the best I can do for ya: Twelve assorted Upper Deck cards, eleven Pinnacle Brand guys, ten random Fleer ones, nine Donruss too, eight Bernie Williams, seven Nick Johnsons, six Derek Jeters, FIVE ORLANDO HERNANDEZeses, four cards I forget, three Matt Drews, two Goose Gossage tributes, and a Babe Ruth Renata Galasso! Bart collects Royals with a little Carlton Fisk thrown in for good measure: Twelve '88 Topps cards, eleven assorted Royals, ten more random Royals, nine positions on the field, eight Bret Saberhagen, seven Bo Jackson, six Kevin Appier, FIVE MARK QUINN CARDS.... four George Brett, three Carlton Fisk, two Wally Joyners, and an Alex Gordon Goudey Rookie Card! And the last one for this evening (well, okay - this morning, given it is now 2:30am) goes to Mark who collects Mets mainly: Twelve draft/rookie/prospects, eleven random Mets cards, ten chrome/best/finest cards, nine assorted Donruss, eight Edgardo Alfonzos, seven Al Leiter cards, six Dwight Goodens, FIVE VINTAGE METS.... four Rey Ordonez, three Bobby Bonilla, two Eddie Murrays, and a Koosman Fleer Greats card! Remember, I am still putting gift packs together, so if you haven't seen yours yet, it just means the elves are still sorting and assembling!! Old West, you ask?? Why yes, this gift pack goes out to Brian, who requested Cowboys and Braves! :-) So, what goes into an "old west" gift pack? 12 Joey Galloway cards, 11 wide receivers, 10 random Cowboys, 9 random Braves, 8 David Justice, 7 Deion Sanders, 6 Mark Lemke, FIVE JAVY LOPEZ...., 4 Michael Irvin, 3 Troy Aikman, 2 'lectric diamonds, and an Emmitt Smith Eye of a Champion! Dayf commented that I had "stolen" his 12 cards idea. The funny thing is, I had not even read his post about the 12 Cards of Christmas before posting my giveaway! That is waaaayyyy tooo weird!! Speaking of the giveaway, things are rolling right along! Of course, in my haste to get the gifts out, I crazily combined two requests! I will remedy the situation before sending out the cards, of course! Somehow, I managed to put together a Cowboys, Braves, Falcons, Hawks combination - no easy task! I'm glad I not only made a list, but checked it twice!! I'm still taking requests, but please try to provide me with several teams (even in same sport is fine), so that I can do my best to send a variety of players and cards. What surprised me right off was the number of requests for Braves cards. Who knew!? I am putting together special "holiday presents" for folks that are interested. Each present consists of 78 total cards. The number is there for a reason (yes, another one of my hair-brained riddle giveaway/trades!). DAYF gets the first stack because, well, I found a bunch of Braves while putting together eBay items when the idea hit me like the something falling from a partridge in a pear tree! In fact, I am calling his the "Twelve Braves of Christmas!" All together now: "In the "12 Braves of Christmas," davidinark gave to dayf: 12 Greg Maddux, 11 vintage brave cards, 10 John Smoltz cards, 9 Steve Avery's, 8 Chipper Jones, 7 Andruw (no-relation), 6 Tom Glavines, FIVE FRED MCGRIFFS.... 4 Dale Murphys, 3 Jason Schmidts, 2 Phil Niekros, and a Hank Aaron Annivers'ry card! So, here is what I am going to do: Ask and ye shall receive. Okay, well, maybe not quite. How about: Ask and I'll do my best to see that ye receive. List the teams in your order of preference, and I will accommodate requests on a first-come first-gifted basis. :-) When you email me, send me your mailing address so I know where to send your Holiday Present. That's it. Email me and ask. I will gladly receive requests until I can't fill the requests (if/when I reach that point, I will be sure to let everyone know) or until Christmas Eve, whichever comes first. Now, this is the season of giving and brotherly (sisterly) love, so please understand that I can only offer one gift per person per household - I want as many folks as possible to benefit from the 78-card gift packs. Cards will be mailed as I am able to put "12 ___ of Christmas" packs together, and you may not get them in time for Christmas Day (in case you were hoping to get these as a 're-gift' item). Happy Holidays, Merry Christmas, and remember kids, Do Cards, Not Drugs! This is my latest acquisition: A 1997 Pinnacle Inside Dueling Dugouts card featuring Manny Ramirez and Juan Gonzalez. There are only 3 or 4 of these that feature Tribers, so I'll be on the lookout for those others. 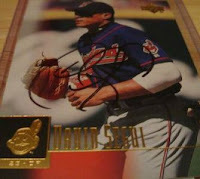 The front of the card features one player (Gonzalez), lots of gold foil, the Pinnacle Inside '97 logo, and the team logo. The back features the other player (Ramirez), copyright info, and team logo in addition to the card number (13). Both sides feature a 3-hole window through which stats are displayed from various years. The right edge (if looking at the card front) features a wheel with 1992-1996 printed on it. As you spin the wheel, stats are revealed in the triple-window on the front of the card. Collectors can then flip front-to-back and compare notes (er, uh, Duel those Dugouts!). Now that we know Mr. G is on "the list," let us compare notes, shall we? Well, it seems that the averages are fairly close to each other (except in '93). Things get very interesting in the HR and RBI columns, though. Now, I did not read to see WHEN JG supposedly used "enhancers," so I have no idea if his numbers reflect use or not. I will not speculate, but rather, I will leave that up to you, my reader, to make of the numbers what you wish. It could be the result of experience, the result of more stringent workouts, ya just never know. But, when the batting averages are similar, what makes one player have some killer HR/RBI stats versus another player? Talent? Skill? Experience? Luck? Performance-enhancers? Regardless of what makes up the difference, in my eyes, they are both very skilled players. Period. Just a quick post to update you all on the "Great 98-cent Experiment." I listed approximately 360 cards during the experiment. Of those, 221 went unsold in any form or fashion. 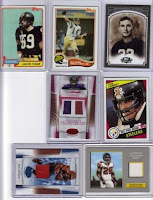 To recap, here is what I did: I listed the cards at $.98 total starting bid (free shipping). Most of the cards that did not sell at the $.98 starting bid were then relisted with a starting bid of $.05 with a shipping matrix (basically $2.00 for the first card and $.25 for each card after that). Only ONE card (A 2007 A&G Mini Lance Berkman) sold at the $.05 matrix. Second, my experiment was not without its flaws. The main is that to be truly accurate, I would need to sell the SAME cards at the $.98 and at the $.05 in order to have true card-based representation. Third, It seems the appeal of free shipping attracts more buyers and more POTENTIAL buyers. What brings me to this conclusion? I had many more "watchers" for the $.98 items than the $.05 items. Again, this is flawed because the same cards were not used throughout both types of sales. The highest-priced item during the experiment was a Serially-numbered Topps Gold Rookie of Albert Pujols. Many items went for the starting bid of $.98, and as I mentioned before, many items did not sell at all, which leaves me with about 11800+ cards still to go before completely selling off the huge "Dealer Store Closed" lot I bought... Well, that's not exactly right. 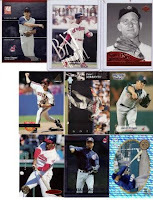 After all, I *DID* pull out the Indians cards, and some Braves cards going to dayf in another "riddle-type" offering (more on that in a later posting). All in all, the experiment was fun and put some change in my pocket for my trouble. Not too shabby, I'd say. No, I'm not talking about the New Year's Ball, nor am I referring back to Doug Jones' ball. I am referring to the Mitchell Report. I have not posted in a few days, I know. Part of that is due to my new part-time full-time job of selling (or trying to sell, anyway) cards on eBay. Another reason for the lack of posting is because I wanted to wait until the Mitchell Report came out to see what Tribers were (or were not) on it. Paul may be using (or have used), but at least he has a medical reason, right!? 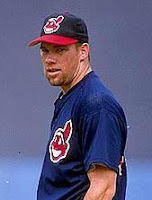 Steve Woodard... His name doesn't even ring a bell for me... Lots of good the suspected 'roid use did him, huh? Dang it, David Justice got himself on the list after all. I was always a fan of Dave Justice, despite his antics. Seeing him on the list doesn't change my opinion of him during his Tribe days. He was great. Glenallen played during the time I had taken a break from collecting, watching, or anything else related to baseball. Someone else will have to chime in on how they think 'roids affect his play (if at all, and if he actually used). These quarter-sized coins are housed in a clear plastic holder and feature player pictures on the front. 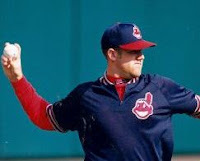 The fronts also show "Cleveland Indians" with the player's position to the left of the photo, the player's jersey number on the right of the photo, and the player's name at the bottom. The back also says "Cleveland Indians" along the top with the "I" script logo on each side. The center of the back features the "Wahoo" logo with "2007 Collection" underneath. From what I have been able to put together, these were special items available at games with a coupon from the Plain Dealer newspaper. They were $2.99 (plus tax) with the coupon, and I would guess they sold plenty without the coupon (I mean, really, who is checking for the coupon here?). According to the cardboard stock, there are 22 of these coins in the set. I have three individual players: Fausto Carmona, Victor Martinez, Grady Sizemore (x2). I'll be scoping out eBay and Beckett and where ever else I can find these to complete my set. I really don't know how I ended up being such an oddball collector... Heh-heh, I guess you can put the emphasis on "oddball" in whatever way you see fit! The great "98-cent Experiment" on eBay is going is little slower than I had expected (98-cent opening bid with free shipping). But, for control measures (for lack of a better term), anything that does not sell will be relisted under some "regular" guidelines - that is, starting bid of $.05 with $1.00 shipping. I'll let you know how that goes, too. Of course, there are still about four hours left (at the time of this writing) for the first batch of listings (I ended up doing three batches of about 30 cards each), and I know a lot of people are sniping, so I may be surprised at the final results of the 98-cent experiment. Yesterday, I posted about having gone through the 6000+ (which is actually about 12000+) cards I bought on 'theBay' not long ago. Well, in my haste to start selling the cards, I managed to skip an entire 3000-count box during my solo sorting time! See? This is why you WANT your kids to join in the process! Oh well, it has been fun looking through the cards to find Indians, inserts, etc. Yes, it really is 2:45 in the morning as I write this. Why? Well, I decided to start posting some of the cards I got in my gazillion card purchase. 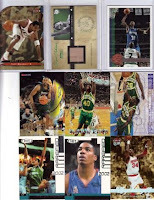 I started with a handful (okay, like 45) basketball cards before getting tired of entering the info (I use Turbo Lister, for now anyway). I realize that is not a lot to many folks, and it doesn't even begin to make any resemblance of a dent in the rows and rows of cards I have, but it is a start. Turbo Lister also ticked me off. It calculated my fees incorrectly, so I modified the starting bid prices, then once they were posted, eBay had the correct fees assessed. UGH. Oh well, I am offering any of the cards I put up for sale at NO SHIPPING. We'll see if that leads to more or fewer sales. Would you rather pay $.98 for a card with no shipping or $.05 for a card with $1.50 shipping? Seems like a no-brainer, but you never know the psyche of potential buyers... Here is my current listing: (Here - new window or tab). The purchase has about the same number of football and baseball cards, with a ton of basketball thrown in. There are also some hockey cards and other sets, like "American Pie" and "Olympic Heroes." I was a HUGE Mary Lou Retton fan in '84 (she is about a year or two older than I am and lived not far from where I grew up). One of the Olympic Stars cards is of her. Not sure if I'll keep that or not.. I was asked if I had videotaped the sorting session with my daughter. I wish I had, but it was one of those things that came together quickly and recording the event for posterity never entered my mind - dang it! I mentioned a couple times that I had won a box of cards. Well, turns out to be TWO boxes (technically four boxes, two shipments). As I was searching through this shipment, looking for Tribe cards, my eyes caught sight of something that looked like it said "Hank" passing by in a blur. I stopped, backtracked a little ways, and sure enough, Hank Aaron was staring at me. Surely this was one of those Topps Archives cards, I thought. But, no, the condition was too worn for it be an Archives. I slowly turned it over, scanning every inch for some modern-day copyright mark. There were none to be found. I turned it over and over, marveling at the front, reading the back, finally letting it sink in that I held in my hand a 1957 Topps Hammerin' Hank Aaron card. I collect Indians almost exclusively, but I am not a moron (well, perhaps it is too early to say that yet - read on). I had been sent an original card from the baseball gods themselves. Had my Dad not passed away this year, I would have wrapped this puppy up and given him the surprise of a lifetime (I believe I have relayed the story of his "disappearing" ball cards, but I will check the posts and See. If I have not told you the story, I will) - one of the cards from his childhood collection. This trade comes from Brandon in Kokomo (and, yes, I hear you singing the song in your head right now!). I tried very hard to honor Brandon's request, alas, the closest I could come was a couple Yankees. This trade falls under the "any oddball ya got!" category, and I am glad to accept it! Though my collection is accurately 99.97% Indians, I do collect certain other players, and Ryan is definitely one of them. This coin commemorates seven career no-hitters. I have never had a coin minted from another country (except "Canada, but that doesn't count because it's, like, attached..."), though I have seen those commercials for "painted" coins from Liberia. Evidently, Liberia makes a killing off of producing money featuring things we Americans like to celebrate or commemorate... Who knew? 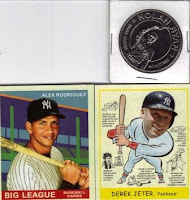 As for the Jeter and A-Rod: I like the "Heads-up" versions of the Goudeys, and you get to learn things like the fact that "Derek is Bob Dylan's favorite baseball player." That'll be on some game show, I'm tellin ya! A-Rod opts for the classic "bat on shoulder" pose. In a way, I always found this to be an odd pose because I have heard more than my share of coaches constantly yelling, "Get that bat off your shoulders!" I received my box(es) of 6000 cards, as I had discussed winning on eBay not long ago. 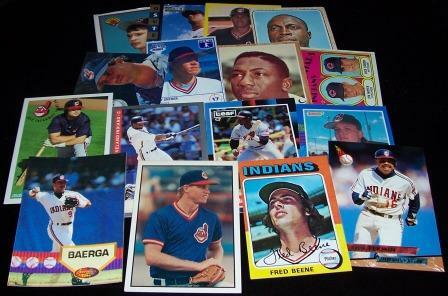 My 5-year old daughter and I went through every card, picking out the Indians. I will input the ones I need into my card database, and then put the rest up for sale (along with the other 5950 cards) soon. The shipment is in two 3000-count boxes, so I pull one box onto the floor. Using an unopened pack of hockey cards in the box as a divider, I pull out a stack of cards and hand them to my daughter. I then grab a stack for me. "We're looking for Indians, Honey," I tell her. "Okay," she says, and begins to cycle through the cards, creating a scattered 'pile' on the floor. About halfway through her stack, she stops. "How do I know which ones are Indians?" "Look for the picture of the Indian (the logo, though she knows what I mean because she has seen the 'picture' a billion times now), or the card will have the word 'Indians' on it. It begins with an 'I' for 'ih-ih-ih-Indians." I sound it out, so that she knows what to look for. With one side of her mouth cocked upward and a raised eyebrow, she invokes the 'tone of DUH' and says, "I know what Indians starts with... Ih-Ih-Ih like IGLOO..." The 'DUH' is not vocalized, but I feel it hanging there just the same. All I can do, of course, is laugh. She picks up the cards again, and this time methodically searches for Indians. She discards football, hockey, and basketball cards. All the while, she is calling out teams like the Pirates, the Red Sox, and the Cardinals. Frankly, I'm impressed. She does hand me a couple of Braves, thinking they are Indians, and again, I cannot help but smile at the aforementioned email from dayf on the subject. So, now you know... If you have young child or relative and have not had this experience yet, I encourage you to try it out for yourself. It's a memory you will both keep for a long, long time.